Births announced this week are: Jaclyn Nicole Poe, Nov. 13, daughter of Darin and Amy Poe; Austin Gene Sharp, Nov. 27, son of Ruben Baker and Amanda Sharp. County officials vote to proceed with condemnation action on property needed to construct the Harrison County Justice Center. The Levi building on the southeast corner was purchased for $150,000; property on the northeast corner was purchased for $32,000; and the Cooper property for $135,000. Holiday greenery has a history that goes well beyond the Victorian Christmas tree we gather around today. Most of the holiday greenery we use to decorate dates back to the pagan holidays of the Romans and Northern Europeans when certain plants where chosen for their symbolic powers of restoration and protection. With the holiday season around the corner, you can reduce holiday stress and the after-holiday bills by developing a budget for gift-giving, food and entertainment expenses. According to the National Retail Federation, the average shopper spends $832.36 on holiday gifts, food and decorations. 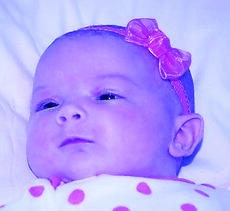 Kennedy Laine Slade was born to Kevin and Becky Slade of Minot, N.D. on Oct. 16, 2009. She weighed 8 lbs. Births announced this week are: Elizabeth Dianne Darnell, Nov. 17, daughter of Chris and Selena Darnell; Emma Grace Nelson, Oct. 21, daughter of Bobby and Amy Nelson. HCHS star baseball player Chris Snopek signs with the Kansas City Royals. He began last season with the Pawtucket Red Sox, the Class AAA affiliate of the parent Boston Red Sox. About one month into the season he was traded to the Cincinnati Reds and finished out the season at AAA Indianapolis. Grayson Beth Barnes was born to David Lee and Lalena Beth Brannock Barnes of Leesburg, Ky., on June 4, 2009 at St. Joseph East Hospital, Lexington, Ky. She weighed 6 lbs. 3 oz. •Kyla Lee Anderson and Brandon Shane Hadley announce their engagement and forthcoming marriage. The wedding will take place on Jan. 1, 2010 at 6:30 p.m. at Gaylord Opryland Resort, Nashville, Tenn. Proper winter storage for equipment is just as important as proper winter storage for plants. If you dig your dahlias you better bring your hoses in from the cold, too. During the five weeks between Thanksgiving and New Year’s, Americans produce an extra one million tons of trash per week compared to any other time of the year. Thinking green this holiday season can include more than just boughs of holly. Whether it is shopping, choosing a gift or entertaining, small changes in your holiday habits can make big differences. Here are a few ideas and suggestions on how to have a wonderful, gift-giving holiday season and still be earth friendly. July 26-28: Harrison County 4-H Hunter and Home Gun Safety Education, July 26 and 27, Harrison County Extension Office 6-9 p.m., July 28 at the Roberts Family Farm on Mudlick Road. Real human advancement was made when we finally figured out that saving seed from the very best food plants was a way to get some really good food next year. The pumpkins that the Wampanoag served the pilgrims where more like gourd if compared to the sugar pumpkins available today. The evolution of tastier food crops was aided by the human hand through the process of seed saving and meticulous selection based on vigor, pest resistance, drought tolerance, yield and taste. 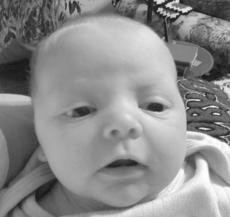 Dakota Alan Rhoades was born to Tara Rhoades of Cynthiana on Oct. 8, 2009 at Harrison Memorial Hospital. He weighed 6 lbs. 10 oz. 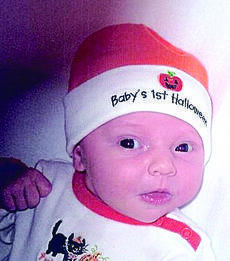 Andrew Jeffery Pergram was born on Nov. 2, 2009 to Carl and Pamela Pergram at Harrison Memorial Hospital. He weighed 6 lbs. 10 oz., and was welcomed by his sister, Athena Collins and the late Carl D. Pergram. 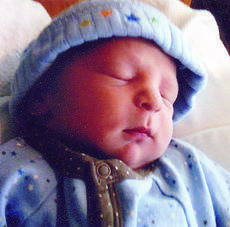 Ryan Eugene Kiskaden was born to Jeff and Rachael Kiskaden of Cynthiana on Nov. 9, 2009 at Harrison Memorial Hospital. He weighed 6 lbs. 2 oz. Births announced this week are: Rees Walter Box, Nov. 9, son of Michael and Lea Anne Box; Taylor Lee Ritchey, Oct. 16, son of Shawn and Elizabeth Ritchey; William Luke Schuller, Oct. 28, son of William Bryce and Juawanna Lynn Schuller; Kyler Blake Williams, Aug. 12, son of Charles and Sherri Williams. “You want me to do what?” I asked Chloe! “You heard me, Woody. I want you to take the prize money.” My ears must have still been water logged. “Why, Chloe?” I asked. “Because you are a survivor. It’s hard to believe that the pup who survived alone in the rain is the same one who packed a plug-in blanket.” Everyone giggled. “But Chloe, we’re tied in the challenges.